The A2 is the only trunk route on the northern shore of Belfast Lough that feeds the large and growing commuter town of Carrickfergus. Closer to Belfast the route is catered for by the M5 motorway and includes another short section of dual-carriageway at Whiteabbey. The only bottleneck on the route from Belfast to Carrickfergus is the single-carriageway section from Jordanstown to Greenisland, a problem that is due to be rectified soon. See future schemes. 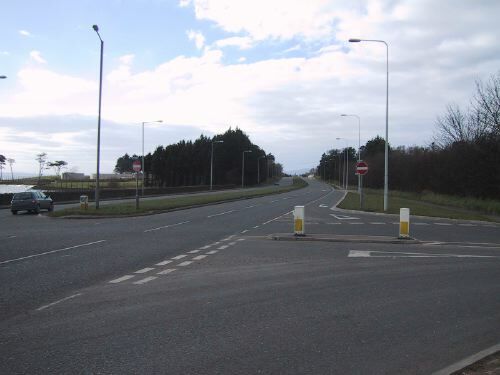 The A2 is dual-carriageway for a short distance here between Greenisland and Carrickfergus, and was partly constructed by widening the existing Shore Road and partly by encroaching onto the beach. At each end of this section the road becomes 4-lane single-carriageway. The road is high-quality and serves its purpose well. *Roads Service insist that this road was built in 1986. However, newspaper reports from the 1960s confirm that it was actually constructed in or around 1964. With thanks to Andrew McKeever for help with this question.